Two Palestinians were killed as youths clashed with Israeli soldiers on the Gaza border on Friday in a new protest against US recognition of Jerusalem as Israel's capital, the health ministry said. The third Friday since US President Donald Trump's controversial announcement on Jerusalem was again billed by Gaza's Islamist rulers Hamas as a "day of rage". It came a day after the United Nations General Assembly voted overwhelmingly to condemn Trump's December 6 announcement that he would recognise Jerusalem as Israel's capital and move the US embassy there from Tel Aviv. Both Israel and the United States vowed to ignore that vote. 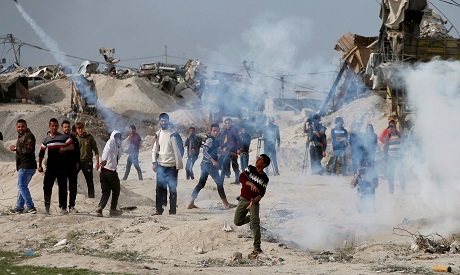 In Gaza on Friday, hundreds of Palestinian protesters at various points along the border threw stones at Israeli forces, who responded with smoke grenades and live and rubber bullets, AFP correspondents said. The Hamas-run health ministry in Gaza said Zakaria al-Kafarneh, 24, died after being shot in the chest in clashes near Jabalia, in northern Gaza. Thousands attended his funeral later Friday, AFP photographers said. A second man, 29-year-old Mohammed Mohaisen, died later in clashes east of Gaza City, it said. Another 94 other people were injured in Gaza, including three in serious condition, the ministry said. One man dressed as Santa Claus holding a Palestinian flag was shot in the leg east of Khan Yunis in southern Gaza, eyewitnesses said. In the occupied West Bank, clashes broke out in Ramallah, Hebron and other major cities, with smaller protests across the territory, including near the Jewish settlement of Beit El. Osama Najar, spokesman for the health ministry in the West Bank, said they had seen protests in more locations than on previous Fridays. The Palestinian Red Crescent said it had dealt with dozens of injuries during the West Bank clashes, including at least seven hit by live ammunition. The clashes broke out after the weekly Muslim prayers, with minor scuffles in Jerusalem. The army said in a statement that around 1,700 "rioters are hurling firebombs and rocks and rolling burning tyres... In order to disperse the riot, troops are responding with riot dispersal means". In Gaza, around 2,000 Palestinians took part in protests, the army said, with soldiers firing "live rounds selectively towards main instigators". By the evening, the demonstrations and clashes had abated, a military spokeswoman said. There have been near daily protests across the Palestinian territories since Trump's announcement. Ten Palestinians have died, eight in clashes and two in an Israeli air strike on Gaza. Fridays, traditionally a day of protest for Palestinians, have seen the most violence. On Thursday, the UN General Assembly approved a resolution reaffirming that the status of Jerusalem must be resolved through negotiations, and that any decision reached outside that framework must be rescinded, without explicitly mentioning Trump's announcement.